In the 17th century most coal was taken from small and shallow "bell pits". Pits were often on common land and run by small groups of families. These families worked in teams. Hewers used a pick or crowbar to remove the coal from the seam while women and children carried the coal to the surface. Pits seldom employed more than forty of fifty miners and often less than twenty. As surface deposits became exhausted, coal miners were forced to go deeper into the ground. 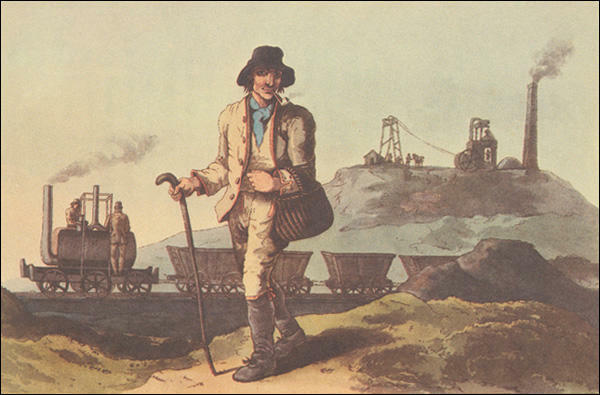 One of the major problems of mining for coal in the 17th and 18th centuries was flooding. Colliery owners used several different methods to solve this problem. These included pumps worked by windmills and teams of men and animals carrying endless buckets of water. Thomas Newcomen worked on developing a machine to pump water out of the mines. He eventually came up with the idea of a machine that would rely on atmospheric air pressure to work the pumps, a system which would be safe, if rather slow. The "steam entered a cylinder and raised a piston; a jet of water cooled the cylinder, and the steam condensed, causing the piston to fall, and thereby lift water." In 1763 James Watt was sent a steam engine produced by Thomas Newcomen to repair. Although many mine-owners used Newcomen's steam-engines, they constantly complained about the cost of using them. The main problem with it was they needed a great deal of coal and were therefore expensive to run. While putting it back into working order, Watt attempted to discover how he could make the engine more efficient. The development of Watt's steam engine resulted in a large increase in the demand for coal. Large landowners, such as the Henry Somerset, 5th Duke of Beaufort, in Wales and the Douglas Hamilton, 8th Duke of Hamilton in Scotland, began to take an interest in coal-mining. It now became profitable for these landowners to employ miners to dig coal from seams that were well over 500 feet below the surface. New pits were opened up in South Wales, Scotland, Lancashire and Yorkshire, and output increased from 2,600,000 tons in 1700 to over 10,000,000 in 1795. 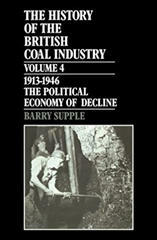 By 1800 Britain produced about 90% of the world output of coal. Its nearest competitor, France, produced less than a million tons. The deep mines developed during the 19th century created serious safety problems. Miners had always suffered from the dangers of collapsing roofs. These new deeper mines meant additional problems. Coal seams deep under the ground emitted a gas that the miners called firedamp. As this gas was highly inflammable, it was extremely hazardous for miners to carry candles with them underground. Every year large numbers of miners were killed by gas explosions. Poor ventilation also created long-term health problems. The air underground contained high levels of coal dust. In 1813, Dr. George Pearson reported that in the course of many post-mortem inspections he discovered that "at the age of about twenty twenty-years the lungs have a mottled or marbled appearance" and by the age of 65 onwards they appeared almost uniformly black. At the time the condition became known as "black lung disease" or "black spit". Later the medical profession gave it the name "pneumoconiosis". By John Simkin (john@spartacus-educational.com) © September 1997 (updated July 2017). (Source 2) Edward Davies, a doctor at Cyfarthfa was interviewed by a Parliamentary Commission in 1841. The average duration of a collier's life is considerably less than of other workmen... because of the frequency of fatal accidents... As age advances, they suffer from chronic bronchial problems. (Source 3) James Brown, a doctor from Pembrokeshire, was interviewed by a Parliamentary Commission in 1841. The average life of a collier is about forty; they rarely reach forty-five years of age... The entire population of Begelly and East Williamson is 1,463... Of this mining population, there are not six colliers of sixty years of age. (Source 4) In 1835 John Sykes used newspaper reports to estimate the number of coal-miners killed in accidents in north-east England. The conditions in the mines and ironworks in the early days are stunning in the brutal disregard they show for the safety of human beings... Compensation for accidents was an unknown thing in those days, and as the deaths of their employees did not affect the finances of the capitalists, from their point of view it was not necessary to spend money in protecting the lives of the workers. There were plenty more to fill the places of the dead and injured. Collier-people suffer much more than others - my good man died nine years since with bad breath; he lingered some years and was entirely off work 11 years before he died. You must just tell the Queen Victoria that we are good loyal subjects; women-people here don't mind work, but they object to horse-work; and that she would have the blessings of all the Scotch coal-women if she would get them out of the pits, and send them to other labour. he was buried underground without food or light for twelve days. Perhaps the most striking example of the way in which capitalists were able to turn the labours of the humanitarian to their advantage is provided by the Davy lamp. Sir Humphry Davy was so shocked at the prevalence of accidents in the mines that he invented, in 1816, his lamp to prevent explosions. The lamp was quickly and widely adopted, Davy himself refusing to take any royalties for what he regarded as his gift to humanity. The actual result was an increase in the number of accidents since the owners were able to open up deeper and more dangerous seams, and, in many cases, the existence of the lamp was made an excuse for not providing proper ventilation. The mineral fuel which constitutes so great a source of our national wealth is not extracted from the earth without a fearful sacrifice of life; either cut off suddenly, or slowly, but as surely, destroyed by inhaling the poisonous gases of the mines. Scarcely a week passes without fatal explosions, of which little notice is taken beyond the immediate scenes of the calamities; nor is it till some thirty or forty human beings have been killed at one flash that public attention is aroused ; whilst the thousands who are sent to premature graves by the daily operating effects of the insidious atmospheric poison are altogether unminded. The "safety-lamp," which in its day was hailed as an important boon conferred by science on the miner, has in practice proved a fatal gift. It has enabled the proprietors of mines to obtain coal in workings that were too "fiery" to be approached with unprotected flame, and the miner is compelled to breathe an atmosphere which the wire-gauze of his lamp alone prevents from exploding. A new pit required new colliers and a new village to house them. Colliery villages were remote, isolated communities, regarded by the world outside as savage encampments. The new villages were inhabited by migrants; the agricultural parts of Durham generally had a shrinking population, but from 1730 to 1801 the population of the country rose from 97,000 to 160,000, as people came to the pits. 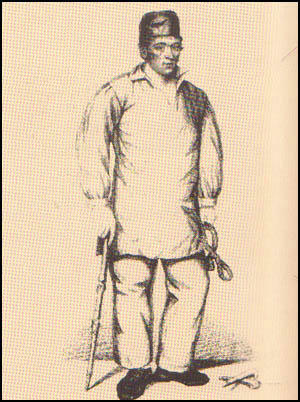 Pitmen's children, according to a report in 1800, were put down the mine when they were 7 or 8 years old, and sometimes as young as 6. The thin seams of Durham are a nightmare... Crawling down the seam, only inches would separate the roof from your prostate body, your head would be turned to the side, flat against the floor with maybe a two-inch space above before you made contact with the roof. Miners... were also prone to lung diseases and ruptures, and many were unable to go on with the work after the age of 40. Accidents were an everyday occurrence: miners fell down shafts, were struck by falling coal or timber at the pit bottom, fell from the rope or skip when going up or down the shaft (cages were not used till later), or were crushed against walls by passing trucks of coal. You go into the cage and then you drop to the pit bottom. You go so fast that halfway down you feel like you're going up again. It's important to clear the men quickly off the surface ... everybody had to be down by seven. When you are at the pit bottom you have to walk about 3 miles to the coal-face. You then pick up your tools - you have to supply your own tools, hatchet, sledge-hammer, a saw if you wanted one and two shovels (one for you and one for your boy). You crawl down to whatever position you are on the coal-face, usually about 120 yards, dragging your tools with you. You need to crawl because it was only about 2 feet high. I worked in a team of 22 men plus 22 boys. We had to pay the boys out of our money. We were paid piecework so we had to work hard to earn our money. We were also paid "water-money". If you were working in water you would be paid a shilling a day extra... The one good thing about coal-mining is the comradeship. You're working in a team and you depend on each other. If anybody has an accident everybody helps. The most important thing is to bring the man out so he can get to the hospital. Although they are losing money because they are not working. For example, one man got crushed - we were not too far in then, about 2 miles. There were six of them carrying him out and I was walking at the side holding his tongue. I had to do that because he kept on swallowing it. We had to walk because we were not allowed to ride on the don (the wooden wagons running on rails which were used for transporting coal). The dangers of work in the coalfields were terrific. In the 1920s the average life expectancy of a miner was fifty. In 1922-24 3,603 miners were killed in pit accidents and 597,198 injured - and this was in a context where injuries which did not keep a man off work for more than seven days were not recorded. Hardly surprisingly, the miners were both heavily unionised and inclined to be militant. By the 1920s more than a million of them were members of the national union, the Miners' Federation of Great Britain (MFGB). (Source 18) Ben Fieldhouse and Jackie Dunn published Casualties of the Mines in 1992, in the book they described what happened at the Abercarn Colliery on 11th September, 1878. Shortly after noon, when 373 men were below ground there came a colossal blast... When rescue attempts became possible, 82 men were brought to safety... Of the number who died, there were 138 married and 70 single men, 56 youths and boys under 18, and 4 widowers. Hartley Colliery has one main shaft, and the great iron beam or lever which draws up the water from its depths, the arm, as it were, of the steam-pump, broke and fell in, carrying beams and bratticing, and the sides of the shaft itself, into the depths below. In ordinary cases such an accident even as this would at the utmost have cost only the lives of the men actually in the shaft. That the falling ruin should jam itself half way down, and so close, as it were, the gate of an entire mine, was a misfortune without a precedent. From the moment the accident occurred there was no want of energy, or judgment, or courage. The viewers did all that experience could suggest, volunteers were ready in scores, and the pitmen were only too eager in their determination not to allow despair to retard the progress of the work. Still, cutting through a closed well is the most tedious of all processes, and so, hour after hour, and day after day, the obstruction was removed, as it were, in handfuls, the workers being cheered for five of the seven days by sounds which gave them hope that the sufferers were alive. They might have been rescued, for they seem to have had food - some corn kept for a pony - and we may hope light; but the mine began in the absence of outer air to generate gas, and on the fifth day, at latest, the whole of the buried miners, arranged in groups, family by family, brother clasping brother, all perished, in most cases without a struggle. Accidents in shafts caused by rope and chain breakages, flooding, fires and roof falls killed large numbers of miners. Until 1851 official statistics were not kept, and powerful colliery owners were often successful at persuading local newspapers not to report the deaths of miners. Collieries in South Wales were considered to be the most dangerous in Britain. 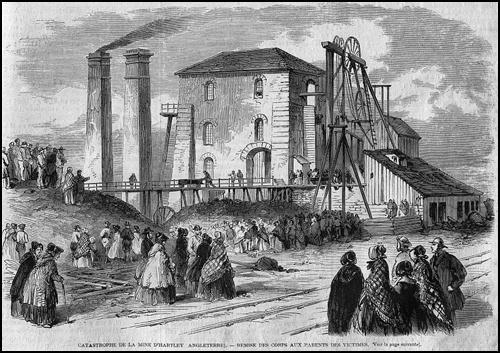 One study of the South Wales coalfield revealed that between 1851 and 1855, 738 people died in colliery accidents. Of those who died, 20% were children under fifteen. Even by as late 1892, 24% of miners' deaths in South Wales were caused by colliery accidents. Question 1: Describe the differences between coal-mines in the 17th century and those in the 19th century. Question 2: Give as many reasons as you can why so many coal-miners died during the 18th and 19th centuries. Question 3: Did the invention of Davy's safety-lamp in 1816 reduce the number of coal-miners who died in accidents? Question 4: What does source 6 tell us about Isabel Hogg's understanding of how Britain was governed? Why do you think she had this view of British government? Question 5: One historian has claimed that in some collieries in Britain miners had a 50% chance of being killed during their working life. Other historians have argued that this figure is too high. Explain why historians disagree about the number of workers who were killed in colliery accidents during the first half of the 19th century.